Energize an introductory ethics course with ETHICS IN THE WORKPLACE 3e, a text that combines a strong foundation in classic and contemporary theory, examples and analysis drawn from the workplace, ethical decision-making models, and a constant focus on self-reflection and moral reasoning. 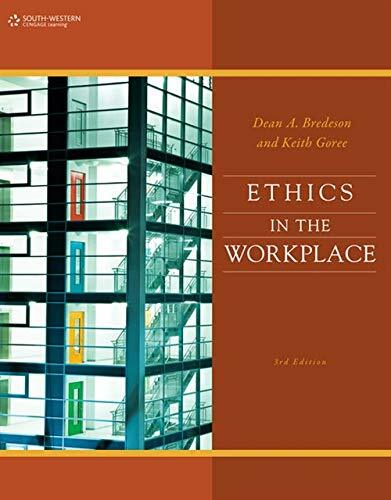 Learning becomes interactive with this completely revised edition that urges users to examine ethical situations in the workplace through the lens of ethical decision-making models. ETHICS IN THE WORKPLACE 3e bridges the gap between theory and reality by focusing on ethics in the workplace and offering real-world examples of ethical situations workers face. ETHICS IN THE WORKPLACE 3e users explore current American values and establish models by which to analyze them as they apply to accounting, finance, marketing, human resource, and management dilemmas. Drawing from news headlines and cases based on well-known people, there's never a shortage of relevant topics and applications. The text is a balanced combination of theory, examples, role plays, class discussion, and self-reflection activities that make studying ethics rewarding, interesting, and effective.